As a speculative fiction teacher and author, I’m sometimes asked what people “should” read in the world of genre. I love giving recommendations. There’s always more out there I want to read, and always an armload of stories I’m eager to thrust into another reader’s embrace. Sometimes, though, the question isn’t about what excites me, or what I think might excite others. Sometimes, it isn’t about “pleasure” or joy at all. Sometimes, the question is a slog into the moors of arguing what it takes to be a True Scotsman. I am far from the first person in the SFF field to take up arms against policing fandom through required reading. What fans are invited and encouraged to read, through the implicit and explicit messaging of bookstore shelves and through the discourse of the community itself, has the power to influence how (and if) people participate as readers of SFF in the first place — which is exactly why “required readings” in the genre are such a problematic concept. Consider how many of the classics of the genre are steeped in misogyny, racism, homophobia, and imperialism. Consider the performative outrage authors and fans alike face when they point out the many ways readers are encouraged not to explore beyond these classics. These arguments about what fans “should” read are all too familiar. Thus, my approach is a bit different, and owes more than a little to Chuck Wendig’s efforts to talk about how what we read can make us into better writers, because that’s what I care about: not just how stories make us better, happier, more engaged, more empathetic people, but how they turn us into storytellers in turn. So say you love SFF. You write it, or want to write it, and you rightly realize there’s some link between what you read and how you write, yet all these arguments about whose books belong on which shelves, or in what canon, do more to complicate than direct your sense of where to go next. The place to start is by asking yourself some questions. What are your goals as a writer? Do you know what you do well already, and what you need to learn to do? Find an author who does something you don’t think you can do (massive battle scenes, complex political maneuvering, intimacy between characters, describing diverse characters without turning their skin into foodstuffs, making implausible technologies plausible, whatever) and pick away at what they do. What kinds of stories excite you? Think about why. Now find a story that’s very much outside your usual reading preferences and try it on for size. What, in this story you would usually assume not to your taste, does engage you? How has the author deftly worked beyond your prejudices to reel you in? Is there something you wish you knew more about? Non-fiction reading can be a powerful means of building up the very knowledge you will need to craft characters, worlds, and conflicts that engage you and your future readers. I’ve just finished a book on how coalitions across different kinds of governments build and sustain power, and it’s already paying dividends in terms of how I write the motivations of manipulative characters. Is there a writer you hate? Like, really, really loathe? Read them. Maybe not a whole novel or book of short fiction. Certainly not their collected works. But go back to that thing you hated and pick it apart the same way you pick apart work you admire, reading it carefully and critically. Give it a chapter or two: enough to both register your initial ick and to process it. Look for the habits that make this writer’s work obnoxious to you, and consider where you, too, might lapse into lazy, glib, transparent, or otherwise weak writing. Being able to articulate why something bounces off you will help you do a better job of understanding who you are as a writer. It’s worth noting this isn’t an exercise that’s always worth your time. If you know that you cannot enjoy Lovecraft’s work because of his deep-seated racism and othering, and encountering that hurts you, you’re going to do yourself more harm than good trying to dig for gold beneath that mud. But if your dislike of an author’s work is a matter of taste and not trauma, there may be something there that will give you insight into yourself. Re-read things. I confess I’m not a frequent re-reader for pleasure. I think this is driven largely by the drowning-deep knowledge that I will never have enough time to read all the things I want to — an over-consciousness of all the new things I’m not taking in to make time for old favorites. But, Goodreads Challenge stats notwithstanding, re-reading has both therapeutic and practical value for a writer. Practically, it allows you to focus on different things every time you pick up the text, because you’re no longer primarily absorbed in understanding the narrative. 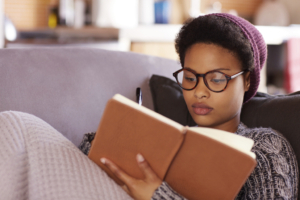 Therapeutically, a familiar text is a creative homecoming — a chance to delight in something all over again — and a confidence-builder for yourself as a writer. If you can take pleasure in reading something a second or third or fifth or fiftieth time, perhaps you, too, will write something that will cast a similar spell over readers. Perhaps someday I’ll stick my neck out a little farther to say what authors I would turn to, following my own advice. There’s always a certain pleasure in seeing another writer’s inner workings. Today, though, I’m not focused on sharing my reading list, because I’m not looking for anyone else’s approval. I’m focused on reading to make myself a better writer. That’s a goal we should all find easy to support.